I’m not going to monkey about with my Guerilla C70 Shadow hockey stick, so I shall try to make no reference to primates or bananas. You can just follow Guerilla’s twitter feed if you want some of that. Guerilla is making some hockey sticks that look awesome and are packed with tech that is designed to smack the ball hard. This C70 T3 Shadow model features a slightly higher bow position than the alternative C70 that is the Deception. The bow position here in the Guerilla C70 T3 Shadow is at 220mm up from the ground. Yes the Guerilla C70 T3 Shadow is targeting you clever people who love a nice low bow but at 220cm it’s actually not so low that it’s distracting. The Shadow range in general from Guerilla is designed as a tool of choice for a player who wants to get the drag or flick power from a hockey stick while maintaining control of the ball. Another great addition to the Guerilla C70 T3 Shadow is the indent in the face of the head. No, it’s not a dent caused by hitting the ball too hard it’s supposed to be there. This feature has been tried by other hockey stick brands, then given up, then changed in to textured material or ridges. Have Guerilla got it right? Well there is a grove that would fit a ball in it, yes. Does the theory make sense, yes. Can you play with it? Personally I’ve not had any real on pitch experience with the stick, a little knock about with someone I bumped in to the club. I can see it working to assist with the ever elusive close smooth ball control when dribbling and I can see it also working nicely for spinning round with the ball to deceive incoming defenders. For me I can see it being a little off putting as I’m too old to be bothered to learn the potential intricacies of developing my dribbling to suit it. If you are committed to mastering dribbling skill to the highest level then I can definitely see the so-called “dished face” (reminds me of a girl I dated) head aiding your efforts. The Guerilla C70 T3 Shadow has a material composition of 70% carbon, 20% fiberglass and 10% Kevlar aramid. It’s nice to review great quality sticks that are not huge chunks of carbon to be honest. 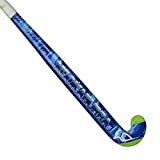 Most of the 90%+ of field hockey players (and students, get a job J) that aren’t internationals can’t devote the time to playing that will really let them adapt to the big 90% carbon hockey sticks around, never mind justify the cost. With a 70% carbon content with an additional 10% or the material being aramid the C70 Shadow might be the best option for a good club player who likes the Guerilla style and wants to retain a nice feel for the ball. One massive feature of the Guerilla C70 T3 Shadow not yet mentioned in this review is the triple core construction in the shaft. You can see from the cross section pictures what that looks like. Any bridge engineers will tell you that you get more strength by adding braces through hollow zones, that’s basically what this does. So far I’ve only reviewed this triple core feature in some of ‘Team’ hockey sticks from Kookaburra although I’m aware of others (which I’m trying to get my hands on) so the Guerilla C70 T3 shadow is certainly leading a charge to what will no doubt become common technology soon enough. Does is hit the ball harder because of this triple core feature. Well the hitting power is slightly offset by the material composition in the Guerilla C70 T3 Shadow. My closest comparison at time of writing is based on my experience with the Kookaburra Vortex i-Bow which has slightly higher carbon content but no aramid or the triple core. Having hit a few with the Guerilla C70 just before training with the Kookaburra I would say that I certainly noticed a more solid slap hit with the Guerilla T3. It might also be that the Guerilla is a little lighter than my Vortex. I would put the unmeasured weight at 50-70g less than the Vortex that I have weighted at 620g for a 37.5” medium. This probably allowed me quicker swing speed, which might account for some of the perceived power difference. Buy the Guerilla C70 T3 Shadow if your personal choice is to standout from the big brand carriers on the field. If you want to and are committed to becoming a great ball carrier and you would like to hit with more power but are worried about loosing the feel of your current stick.